Nigeria coach Stephen Keshi said Lionel Messi "is from Jupiter" after the Argentina forward scored twice in their 3-2 win over the African nation. The 27-year-old scored a half-volley and a free-kick as Argentina recorded a third win to finish top of Group F."Messi is one of heck of a player. He's blessed. You can't take it away from him," said Keshi, whose Nigeria side still qualified despite the defeat. "There are good calibre players in the team but Messi is from Jupiter." Keshi, whose team advanced to the last 16 of the World Cup after Iran lost to Bosnia-Hercegovina, added: "I feel honoured and happy it's going our way, I want to thank the players and the fans and some of the media." 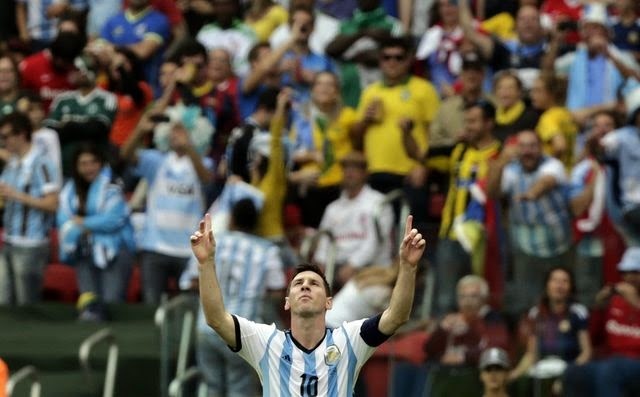 Messi is now joint top scorer at the 2014 tournament with four goals, alongside Brazil's Neymar. Prior to Brazil 2014, he had scored just once in eight World Cup matches. The Barcelona star paid tribute to Nigeria, who equalised twice through Ahmed Musa before Marcos Roja scored a second-half winner for the two-time champions. "We played against a team that wanted to play," Messi said. "I think we saw a good Argentina. We need to continue on this path." Messi had previously only scored one World Cup goal in 571 minutes, but former England striker Gary Lineker believes he is now comparable to Argentine compatriot Diego Maradona. Maradona inspired Argentina to their 1986 World Cup triumph, scoring twice to eliminate Lineker and his England team-mates in the quarter-finals. "I don't think since Maradona we've seen anyone quite like Messi on the field," said the Match of the Day presenter. "They're very similar players in many ways: both have that mercurial left foot, balance, precision, the ability to beat players very easily and make the game look simple. "And he scores goals as well. Diego was an unbelievable player, certainly the best of my generation, and he was unbelievably creative, he could do all those sort of things, but he wasn't as prolific as Messi is, he didn't score quite as many goals." The South American side will now play Switzerland in the last 16, while Nigeria will face France. "As we advance we start improving our structure, in general I saw improvement today," said Argentina coach Alejandro Sabella. "We've got nine points, but we can always get better."